Draft horse emporium. 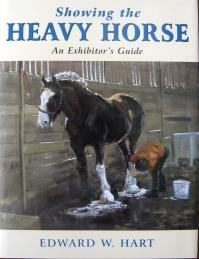 Super help for the draft horse enthusiast. Driving horses from all breeds are showcased in our store. These majestic horses have toiled for mankind and now enjoy a place not just in the fields or street, but the show ring too. Whether a Shire, Ardennes, Belgian, Irish Draft, Suffolk or any heavy horse breed, their special needs and training requires extra knowledge as a horseman, and we hope you will enjoy the products we have stocked to aid you and your team. Looking for a specific item? Click on the department link, i.e. Books, DVDs etc. The Last Warhorse. Award of Excellence Movie. Shire Horse Lovers Card Artist Malcolm Coward. 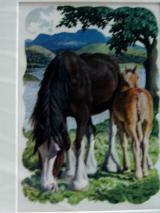 For the Shire horse lover this blank card heralds the beautiful "King"